Today I'd like to continue sharing our Golden Anniversary to Britain. It's taking quite a while to record all of our visit as we were there for four weeks. Believe me we took advantage of every moment there. We had a marvelous time and I do appreciate you visiting with us. 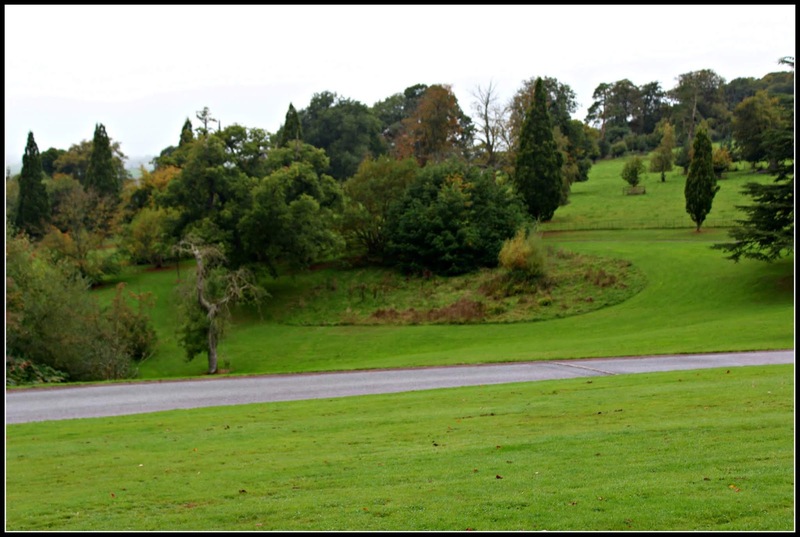 After visiting Arlington Court, we drove to visit Knightshayes. 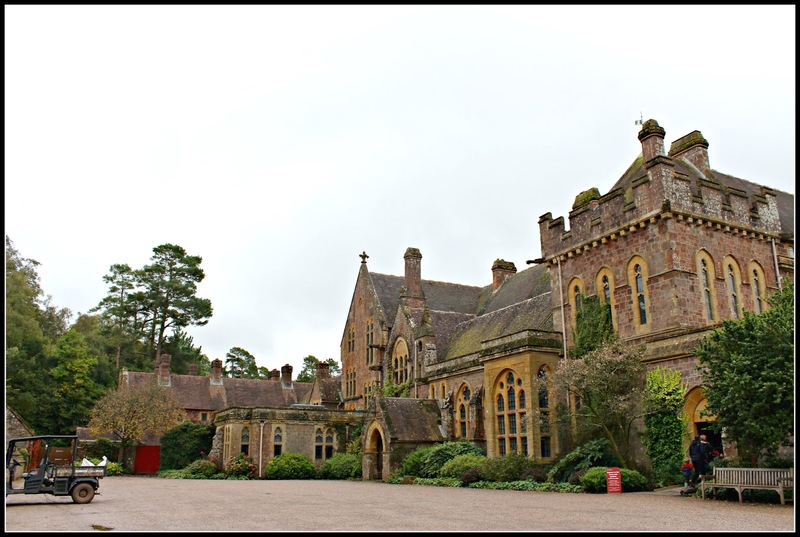 This very large estate is located in Bolham, Tiverton, Devon. Come along with us as we travel to a most interesting estate. The rolling hills of Devon are delightful to view. We secure a spot in the car park and head to the stable. It has been converted into a reception area along with a shop and a cafe. You know me, I don't miss a meal so let's stop and eat before we tour Knightshayes in the cafe. I didn't take photos of our meal, but I did record in my journal that Grayden had quiche and I had a Teddy Devon Pie, which is a savory pie made of potatoes and onion. I understand in Devon, teddy is a potato! 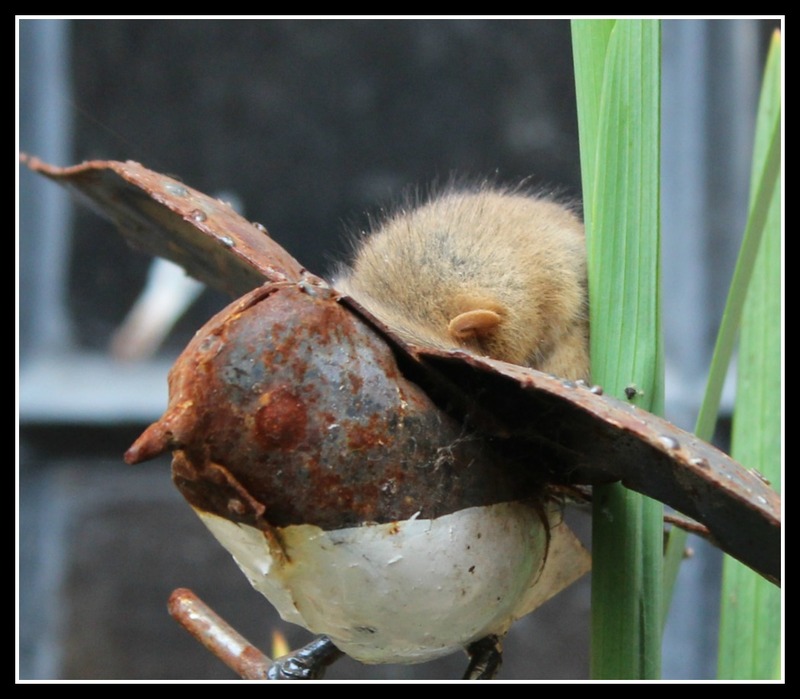 Walking out of the small courtyard, a lovely visitor pointed out this adorable dormouse resting in a garden ornament! Isn't he darling? Knightshayes is a Gothic Revival house. 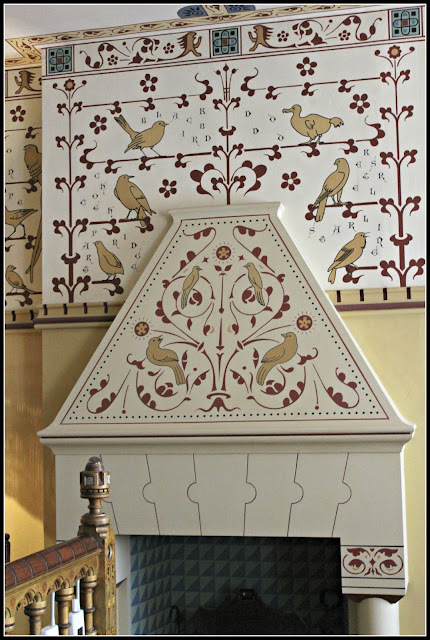 The house is a rare example of the work of Victorian architect, William Burges. You may remember reading about his work in other spots we have visited. He is mostly known for his work on churches. 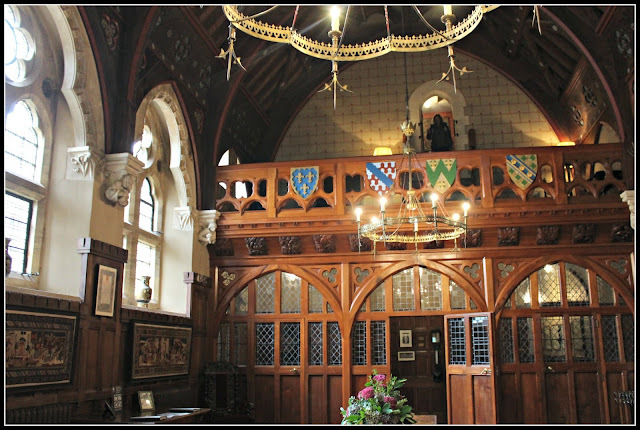 Knightshayes is the only Burges designed home that the public can tour. 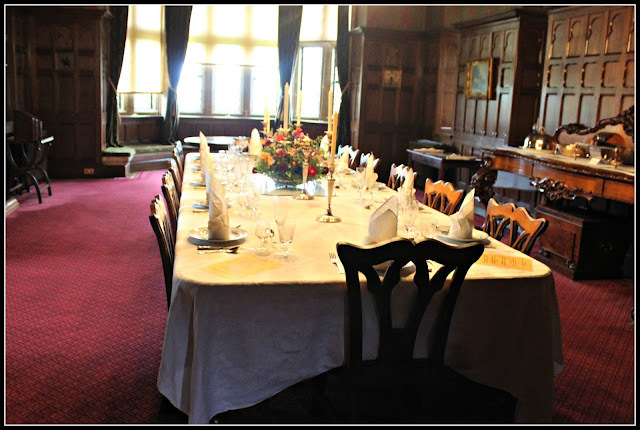 Knightshayes has been the home of three generations of the Heathcoat Amory family. The family made their fortune in lace. John Heathcoat Amory had the house built. He was the grandson of Sir John Heathcoat who was the creator of the lace bobbin making machine. He owned the lace factory in Tiverton. 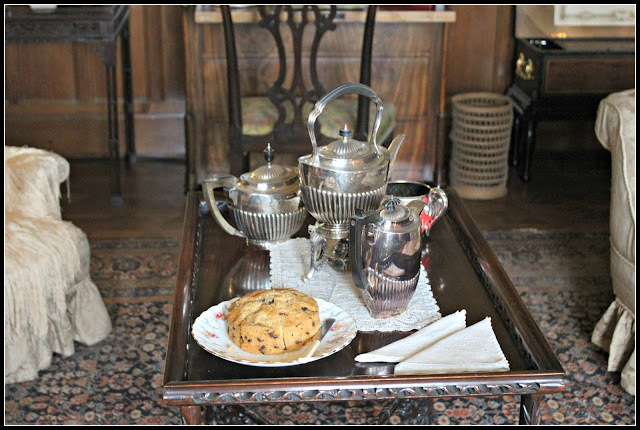 The family gave the home to the National Trust after living here for over 100 years. Come inside with us. Stepping inside we realize the massiveness of this house! The family was not happy with William Burges' progress on Knightshayes so they fired him after he worked on the project for four years. They then hired John Crace to finish the inside of the home. Most of his work was covered up by the family until the National Trust restored the property. Possibly the family was trying to make their home less imposing and more cozy. 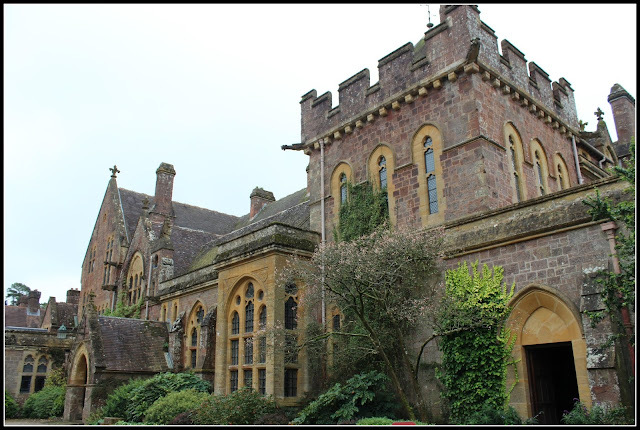 The last member of the family to live at Knightshayes was Joyce Wethered. 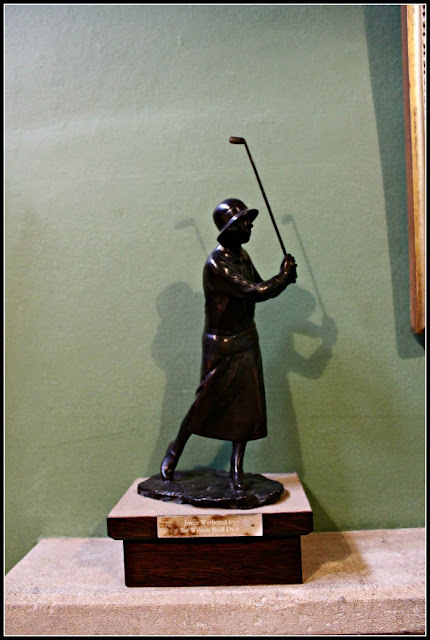 She was a gardener and a world championship ladies golfer. She won the English ladies championship four times. Upstairs the bedrooms were lovely. I think my absolute favorite was the view out the upstairs window of the lovely gardens below. This tree took my breath away!! Let's stop for tea while we continue to visit. 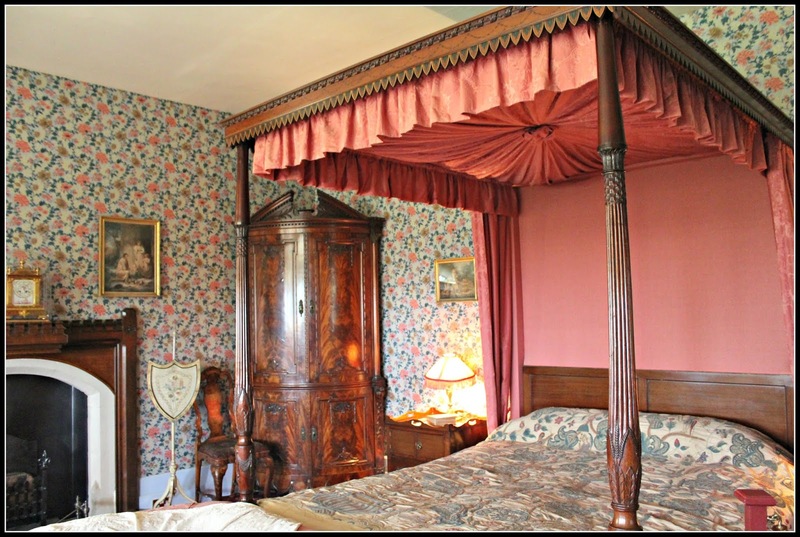 You can clearly see the ornate bed and decor. 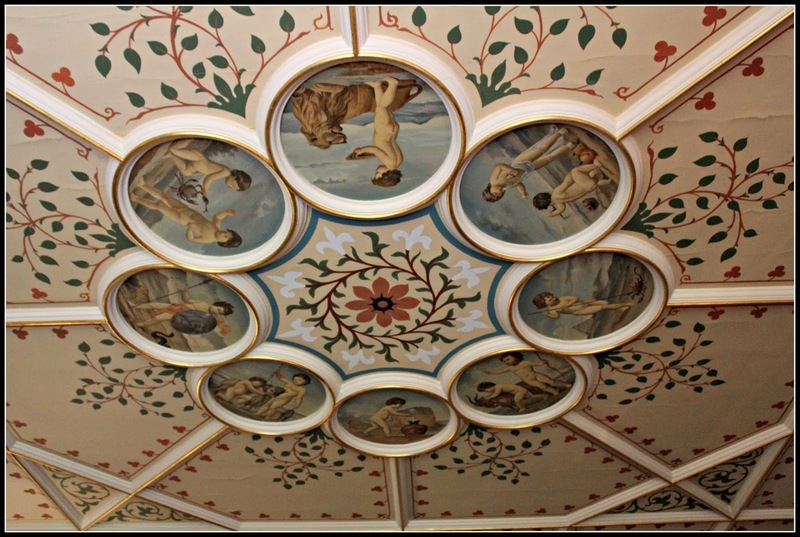 The ceilings in Knightshayes are most ornate. Let's go into the dining room and view the beautiful room. 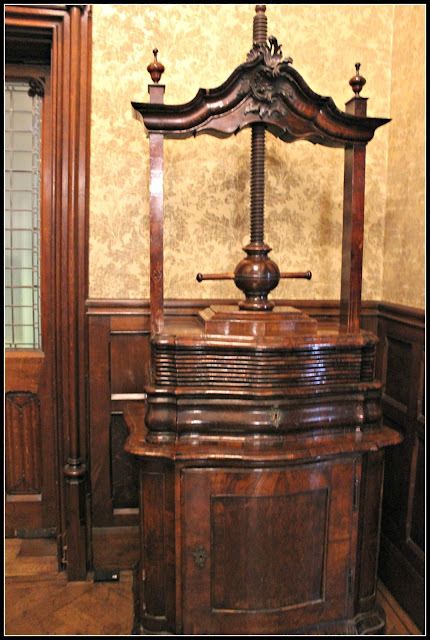 This walnut linen press may be the largest we've seen and oh so handsome! In the dining room we were told that the ceiling was covered up and discovered by the National Trust during renovation. 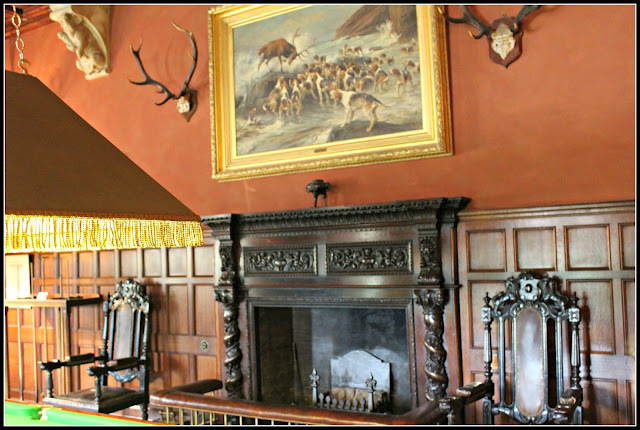 The Heathcoat Amory family covered up paneling and ceilings. Perhaps they didn't like the reminders! The library next to the dining room was a very cozy room. 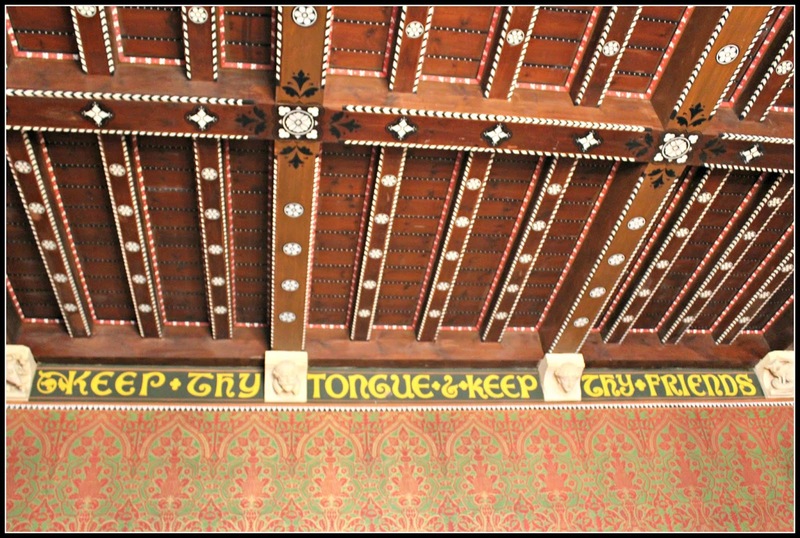 Of course, it too had an elaborate ceiling. 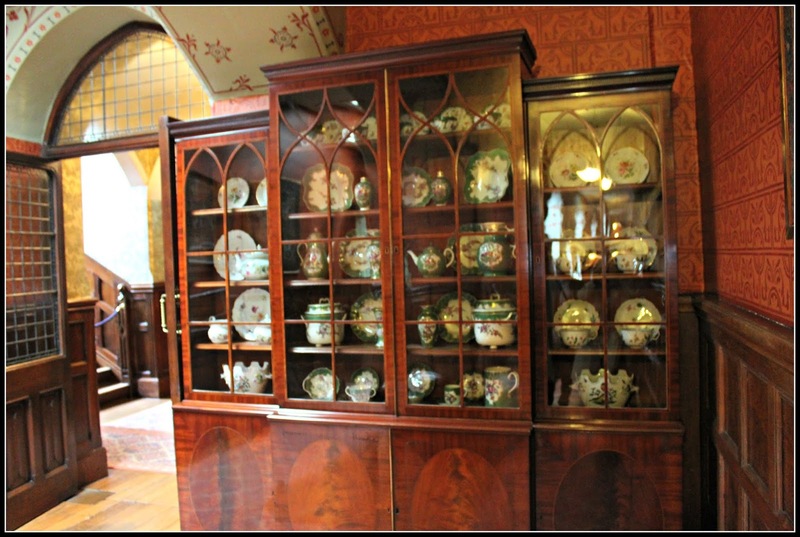 There is so much to see in the two stories that the public is invited to tour in this three story house. Let's go outside and get a little look at the gardens. First we pass by the flower arranging room. So many lovely arrangements awaiting their turn in the home. When we step outside there is that very large bonsai style tree! It is just lovely in the sweeping lawn and flower beds. Gardens were very important in remote estates in Victorian times. To grow food first and then to have lovely flowers for your home. 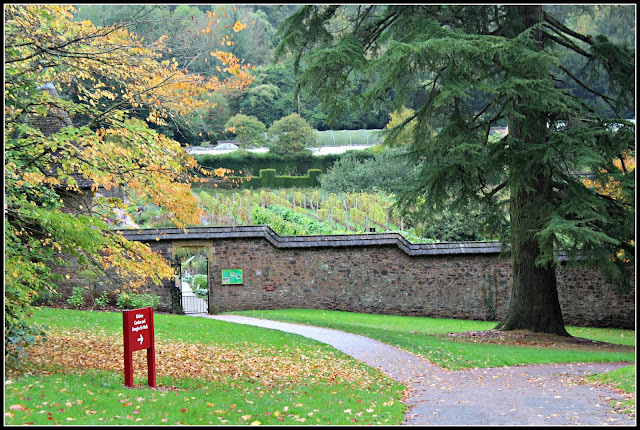 After the two World Wars the walled garden was in poor condition and was restored in 2001. The formal gardens were restored by Sir John and Lady Heathcoat Amory after WWII. It has won many awards with its many species of plants. 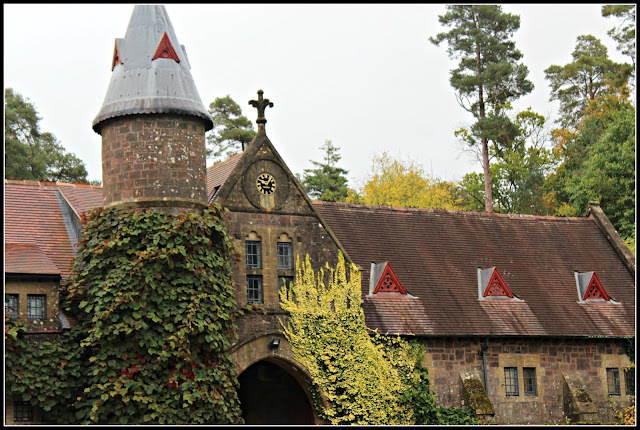 I was intrigued to learn that Knightshayes served as a rest home for American soldiers during WWII. It was a place of respite from the war. Many large estates took on this role during the war. We enjoyed our visit to another very interesting and multi-layered home in Devon, England. Thank you for traveling along with us! Theresa, I'm so happy you are coming along with us as we continue to share our visit. A piece of my heart will always be in Britain. 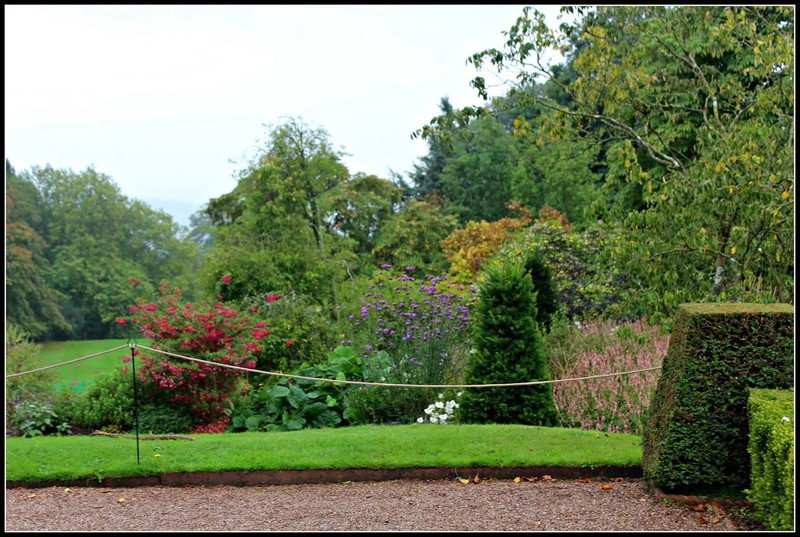 Knightshayes was really grand and glorious just like Downton Abbey. Have a wonderful weekend. I confess to a weakness for Gothic revival buildings and adore everything about them. 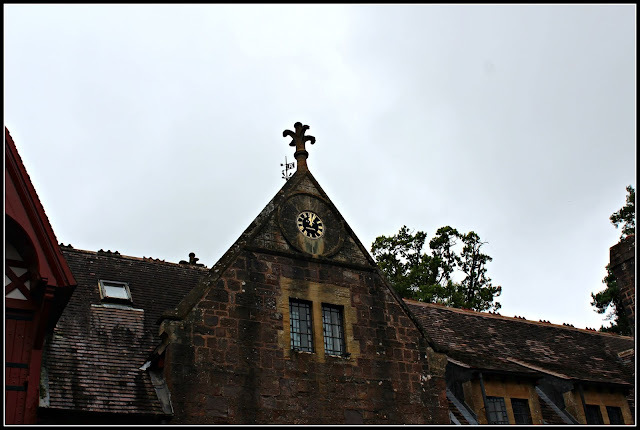 I loved visiting Knightshayes with you, I think I would happily move in, and I am hugely relieved no teddies were harmed in the making of your pie! Very interesting and magnificent. (Not that I’d want to live there.) That tree was amazing and the gardens are beautiful. 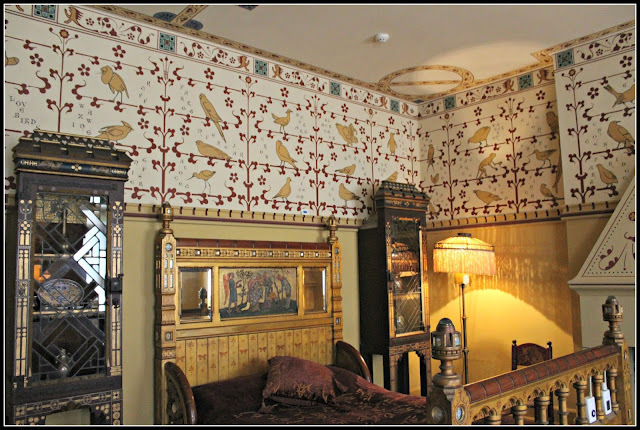 They would probably be my favorite part, though that feminine wall-papered bedroom was very nice. An incredible tree! And you have visited some amazing houses in your England travels. Love those ceilings! Think of how many of those grand houses were destroyed during the 1960s, for lack of funding for upkeep and death duties imposed by the government. It's so sad. I'm always happy to see the ones that have survived! Lovely post. Beautiful rooms. Very busy in the decor for sure. Walled gardens and flowers are what I love to see. I need a walled garden to keep out critters. I love Gothic, always have. Beautiful varying colors of stone that make up the home. Betsy, I know what you mean about the walled garden. We had a huge groundhog in our perennial bed this morning munching away at the plants! You documented your visit beautifully Martha Ellen. These are great photos and I have enjoyed your whole series. Thanks so much! Tiverton was just under 45 miles away from my old village. I know the name well but can't remember a particular visit. These photos make me want to go back and check it out :) One day! Wow what a house! 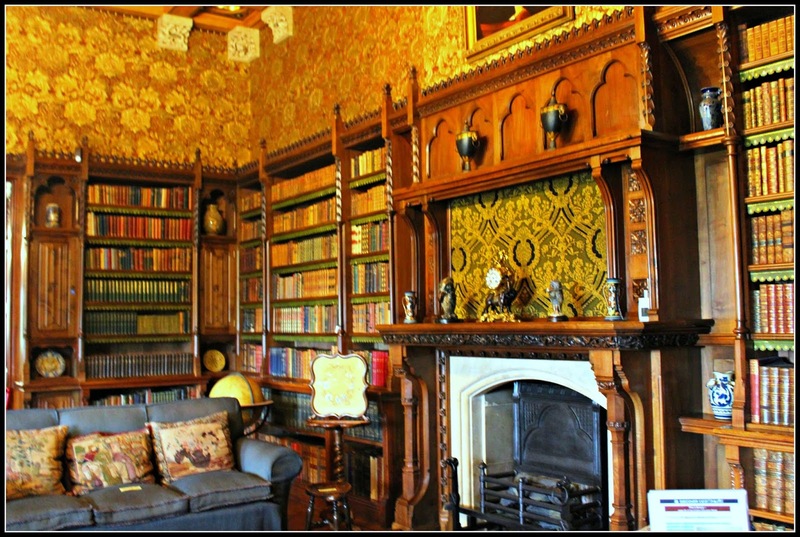 I enjoyed all the rooms, but of course loved the library the most. 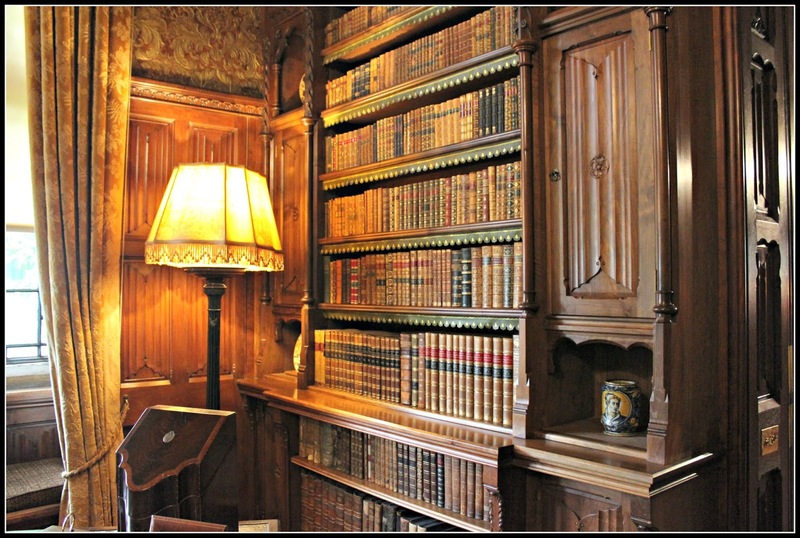 Something about walls lined with books --- and the dining room was amazing too. It looks like you saw the kitchen too--or some service room-- I always enjoy that part of a house tour. 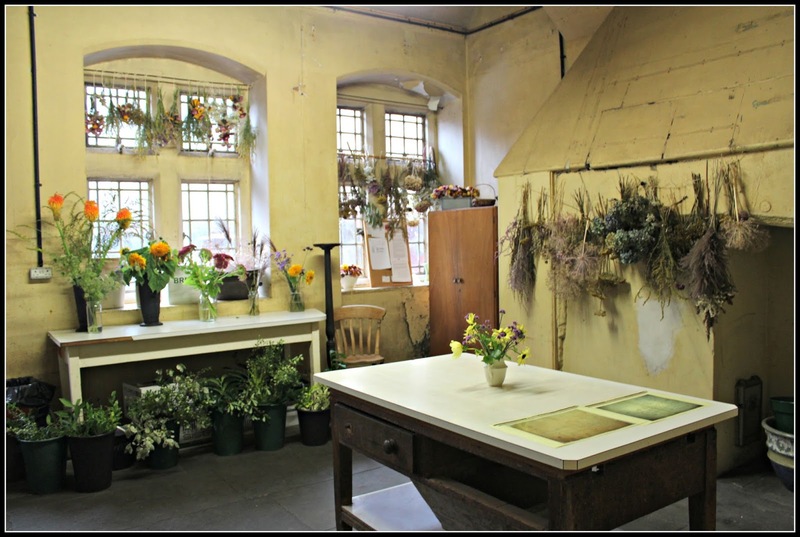 Dotsie, the National Trust used that room for flower arranging. They always make sure there are beautiful flowers everywhere. The library was spectacular and was so cozy. Were you able to find out what kind of tree the "bonsai" was? Did it grow that way, or did it lose some branches along the way? That saying that was covered up is one I need to paint on my walls! I can understand the family wanting to cozy up the place, but it was a shame to cover up all the paneling and ceilings, But one must do what one must do mustn't one to make life comfortable while you still can. I'm not sure what type of tree it was, Cathy. 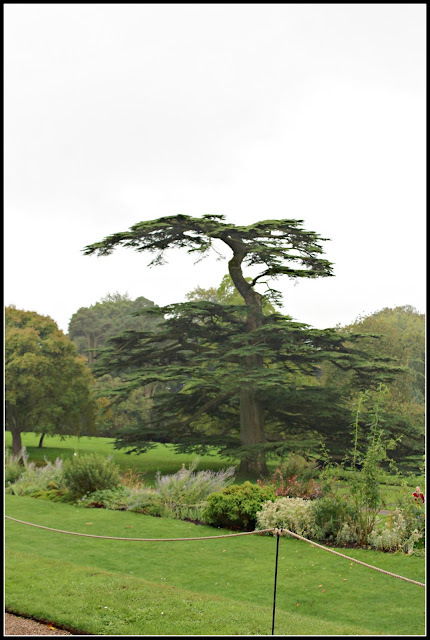 It was a conifer and was so lovely and graceful. I'm sure generations of folks had to lower the ceiling for warmth in the cold winters. Those high ceilings steal the heat in a large room. What a gorgeous property. Thanks for taking us with you. That tree looks like trees we've seen on the California coast called Monterey Cypress Trees. Ellen, thanks for the suggestion on the tree. 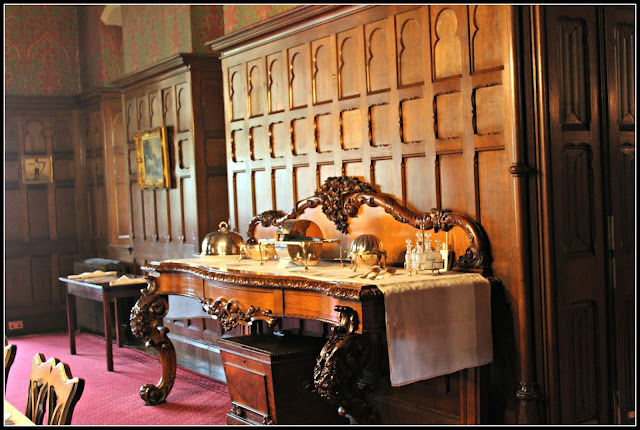 A lot of these large manor homes with their very elaborate gardens brought in plants from all over the world. Thank you for visiting with us today. Another place, another time. Grand indeed, Krishna. Thanks for visiting with us. What a grand tour you have taken us on, Martha Ellen. I have to tell you that the dormouse startled me, as I have an incredible fear of mice, Yikes! The vanity is charming and caught my eye right away, as I have a thing for vanity tables. It really tells a little something about the woman by looking at her vanity table. Love the old perfume bottles. The landscaping is so green and pretty. 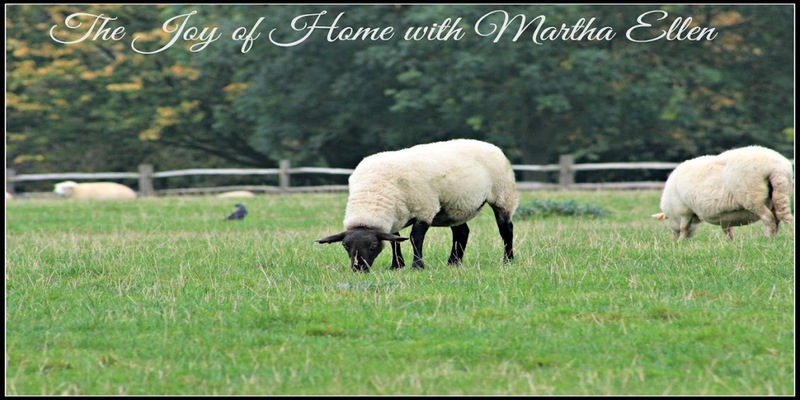 What a charming home this is, Martha Ellen. It must have been a treat to see. Sheri, I certainly don't want mice in my home. It still startles me when I come across a snake in the garden. I am much better than I used to be! I'd love to live in the country, too! Dear Martha Ellen ... Your Anniversary trip has been outstanding and you are such a fabulous tour guide. Imagine living in this gorgeous manion. I think, I would stare up at the ceilings all day long ...They are truly works of art... 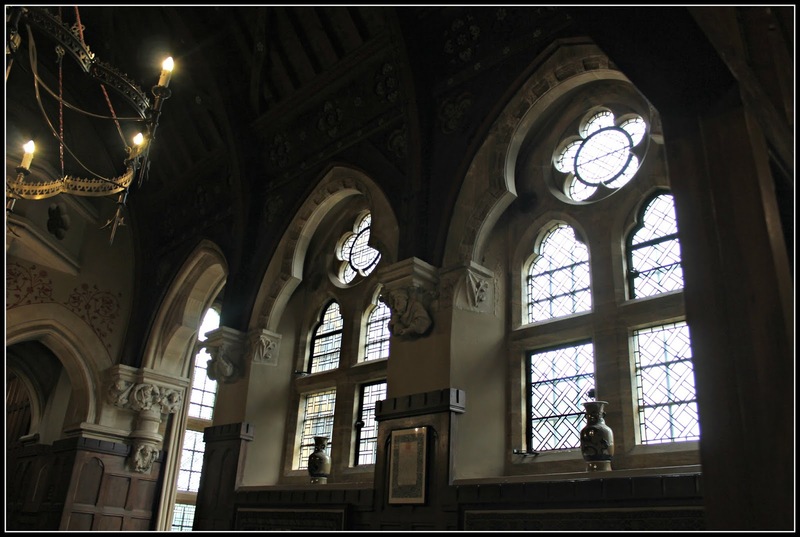 The architecture and windows are so amazing... and you are so good at keeping us informed about all the little details. There are so many marvellous artifacts to view and admire ... 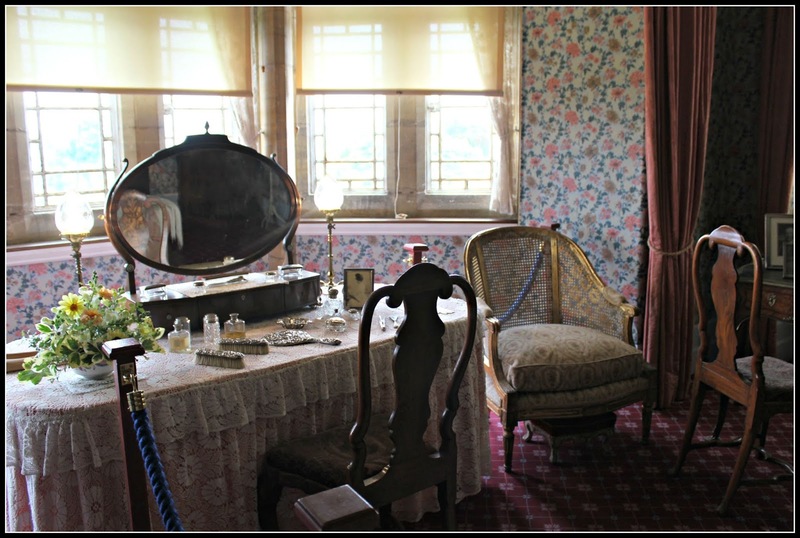 I did enjoy seeing the bedroom and the charming vanity table. I would love to have a little botanical room for flowal arranging. How charming is that !!! The cypress trees and garden simply take your breath away....If only that little dormoouse could talk... I'm sure that would have a few good stories for us(Ha ha)That was such a sweet little picture. ...OMG, this was just an amazing post ....Thanks for so generously sharing your remarkable journey ..I Love it !!! Zaa, you are so kind to come along with us and share in our joy. 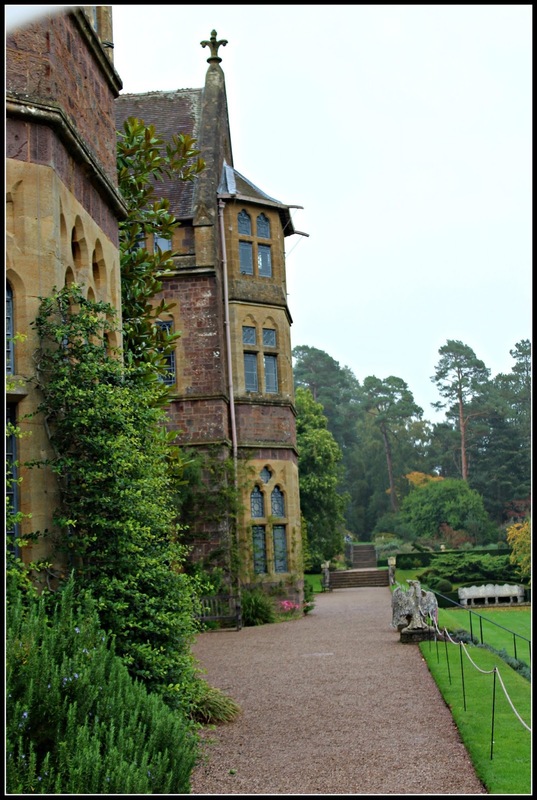 Knightshayes was a grand old mansion. 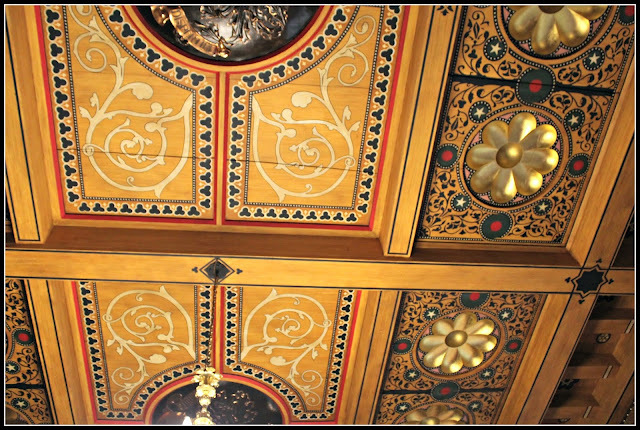 You are right, with ceilings like that, we would be gazing upward. There is so much to learn when we visit a spot like this, I enjoy delving into the details. Thank you for visiting with us. I do appreciate your comments! Have a great day. What a marvelous home, so full of lovely details and fabulous views! A true work of art! The dormouse made me smile. Darling! I'd have been tempted to put him in my pocket and bring him home with me. On second thought . . . I wouldn't want him having free rein in my house. Perhaps he would be happier there in the garden. Great photo!! Cheryl, I'd never seen a dormouse before. He was so sweet snoozing away. Yes, we had leave him to nap away the afternoon. Thank you for stopping by. I hope your day is full of joy! I didn't know that Joyce Wethered won the English ladies championship four times. 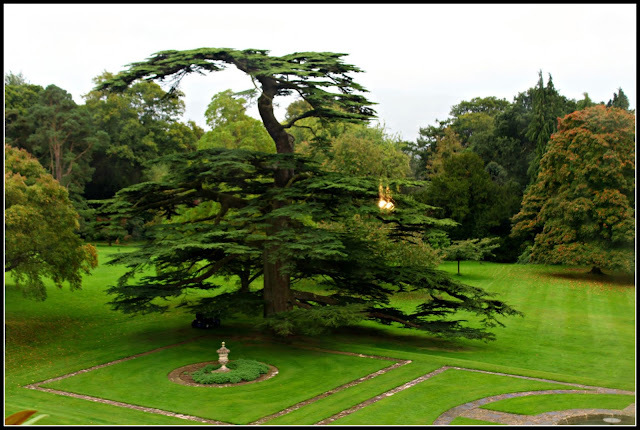 The house is amazing but the gardens truly beautiful, the shape of the tree amazing. 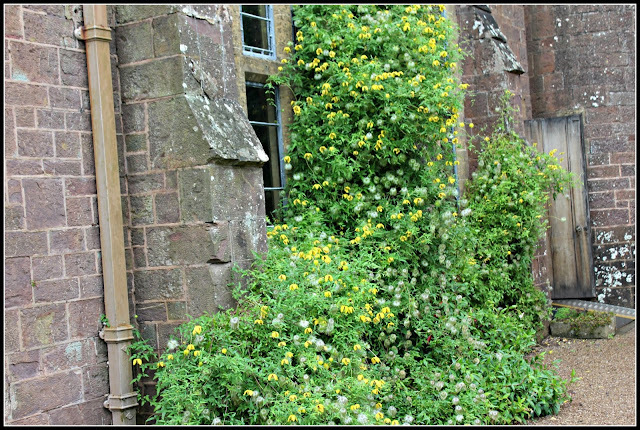 We learned so much on our tour of Knightshayes, Jan. Thank you for visiting with us! Oh Martha Ellen, you are the BEST tour guide! And you go to the best places. This one is really gorgeous. I'd not heard of it but it certainly would be worth the trip -- any trip -- to visit. All the details, so beautifully photographed. I love it that you love England as much as I do and am taking me to places of which I knew nothing! Thank you, Jeanie. 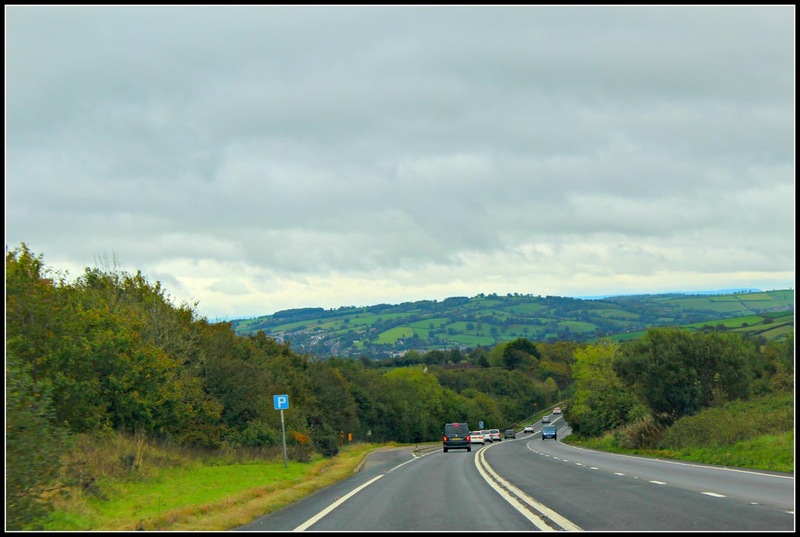 There is so much to see in England, isn't it? It's nice to know another kindred spirit with a heart that loves England like I do! Enjoy your evening.